Photograph of Brown Fruit Farm Workers Outside of the Apple House is a picture, with genre photograph and group portraits. Its dimensions are 2.81 in. x 3.93 in.. It was created in the 1930s decade. 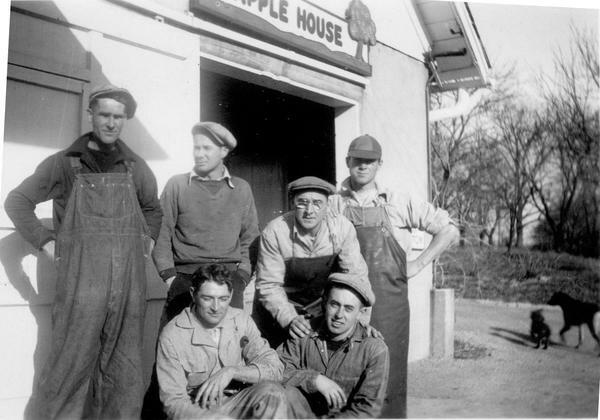 This photograph shows workers posing outside of the Apple House on the Brown Fruit Farm. They have been identified as (back row, left to right) Mr. Armstrong, Marion (Buddy) Lazelle, Bill Snouffer, Bud Monska; (front row, left to right) Murrin Cellar and Kenny Poole. Murrin Cellar was farm manager from 1936 through the farm’s closing in 1958. His father came to work on the farm in 1913 when he was fourteen years old and attending Worthington High School, and he started working in 1915, becoming full time after his high school graduation. At age 19, he supervised the picking of apples and cherries by crews of transient labor. In 1936, after the deaths of Frame and Marie Brown, the farm’s owners, Murrin worked with their daughter Molly to keep the farm running until 1958. Bud Monska began working on the farm as a “piece-worker” as a teenager. Piece-workers were paid by how many quarts of cherries or bushels of apples they picked. He remained working at the farm following his high school graduation and eventually became the orchard manager for the farm, overseeing cherry picking, apple thinning and picking as well as spraying and maintaining equipment. For several years, Bud and his wife and children lived on a property on the farm. He worked as orchard manager for 25 years, as well as the head custodian at Worthington High School for 27 years. Marion (Buddy) Lazelle was in charge of the Apple House, where apples were sorted and packed for sale. A friend of the Browns designed the Apple House sign that became the farm’s logo. Apples in storage were kept at the ideal temperature of 40 degrees, then sent by the crate on ramps with rollers to the Apple House, where they were sorted by size by the apple-grader machine. Workers on either side of the line removed blemished apples. Crates of sorted apples were then placed in the retail showroom at the front of the Apple House. Bill Snouffer was in charge of the Cider House, where apple cider and butter were made. He was also an employee of Worthington schools. The Brown Fruit Farm operated north of Worthington for nearly fifty years, from around 1912 to 1956. The farm sold grew and sold apples and apple products such as juice, candy and apple butter, as well as cherries, plums and honey. As of 1925, the farm encompassed 100 acres planted with 4000 fruit trees and was the largest fruit farm in central Ohio. Owned by Frame Brown and later his daughter Molly, it was renowned not only for the quality of its produce, but also for its innovative roadside marketing, including signs telling motorists how many miles they were from the farm. It covers the topics dogs, agriculture and farm workers. It features the people Louis (Bud) F. Monska, ?-1986, Marion (Buddy) E. Lazelle, Kenny Poole, William M. Snouffer, 1897-1990 and William Murrin Cellar, 1899-1983. It features the organization Brown Fruit Farm. It covers the city Columbus. The original is in a private collection. The Worthington Memory identification code is wcd0234. This metadata record was human prepared by Worthington Libraries on March 27, 2018. It was last updated March 28, 2018. Autumn is officially here, and with it every apple-lover's favorite time of year. Our October exhibit celebrates the history of an orchard that operated north of Worthington for nearly 50 years: the Brown Fruit Farm.